Identification: In general, cichlids (Cichlidae) are superficially similar to sunfishes and black basses (Lepomis and Micropterus; family Centrarchidae). Cichlids can be distinguished from centrarchids by a single nostril opening on each side of the head (vs. two openings in centrarchids) and the presence of a discontinuous or two-part lateral line (vs. a continuous lateral line in centrarchids). Mozambique tilapia are similar to, and could be mistaken for, two other introduced cichlids: blue tilapia O. aureus and Nile tilapia O. niloticus. Distinguishing characteristics, synonyms, an illustration, keys, and a discussion of hybrids were provided by Trewavas (1983); for identification also see Wieland et al. (1982) and Page and Burr (1991). Color photographs appeared in Axelrod et al. (1985). Size: 40 cm SL (Skelton 1993). Native Range: Tropical and subtropical Africa. Southern Africa from lower Zambezi to Brak River, and Limpopo system (de Moor and Bruton 1988). Occurs in both fresh and brackish waters. Table 1. States with nonindigenous occurrences, the earliest and latest observations in each state, and the tally and names of HUCs with observations†. Names and dates are hyperlinked to their relevant specimen records. The list of references for all nonindigenous occurrences of Oreochromis mossambicus are found here. Ecology: Considered a hardy species and very tolerant of high salinities, including growth and reproduction at 35‰ and survival up to 120‰ (Brock 1954; Dial and Wainright 1983; Stickney 1986). 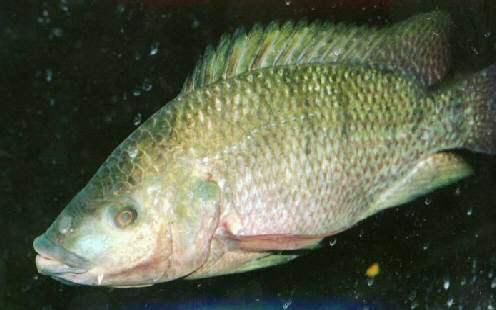 However, the Mozambique tilapia reportedly does not survive temperatures below about 10°C (Talwar and Jhingran 1992). A true detritivore, with the ability to assimilate free nonprotein amino acids directly from detritus (Bowen 1980). Means of Introduction: Similar to O. aureus, this species has been introduced for a wide variety of reasons. Most introductions have been the result of intentional stockings for aquatic plant control by state and federal agencies and private companies, but introductions have also come about from stockings for potential use of the species as an insect control agent (e.g., to control mosquitoes and chironomids), as a sport fish, as a bait fish, and as a food or commercial fish, and through aquarium releases; the species also has been introduced through releases or escapes from fish farms, hatcheries, and zoos (Shapovalov et al. 1981; Dial and Wainright 1983; Courtenay et al. 1984, 1986; Grabowski et al. 1984; Courtenay and Stauffer 1990). This species was brought to Hawaii from Singapore in a small shipment of fish in 1951 (Brock 1960; Maciolek 1984; Randall 1987). The Mozambique tilapia was introduced with the expectation that it would be useful for aquatic plant control in irrigation systems, as a food fish, as a sport fish, and as live bait for tuna fishing (Brock 1960); results were only partially successful (Randall 1987). In California, introductions resulted from escapes or releases from fish farms and from intentional stocking by the state (Shapovalov et al. 1981). The Mozambique tilapia's initial introduction into Dade County, Florida, is believed to have been the result of escapes or releases from aquarium fish farms that cultured the species in the 1960s (Courtenay and Stauffer 1990). In some areas of Florida, this species may have been introduced by local anglers to create a commercial fishery (Dial and Wainright 1983), or intentionally stocked by aquarists (Courtenay and Stauffer 1990). In New York, introduction was probably due to aquarium release (Briggs, personal communication). In Texas, this species was introduced as a result of escapes from the San Antonio Zoo in 1956 and also from state and federal hatcheries during the late 1950s and early 1960s (Brown 1961; Courtenay and McCann 1981). Sources and reasons for many of the introductions have been reviewed by Courtenay and McCann (1981), Wieland et al. (1982), and Courtenay and Stauffer (1990). Status: Established or locally established in seven states including Arizona, California, Colorado, Florida, Hawaii, Idaho, and Texas. Formerly considered locally established but no longer extant in Georgia, Montana, and North Carolina. Reported from Alabama, Illinois, and New York. Impact of Introduction: In Hawaii, this species is suspected as a threat to native species such as striped mullet Mugil cephalus (Randall 1987; Devick 1991b). Tilapia also have been considered a major factor in the decline of the desert pupfish Cyprinodon macularius in the Salton Sea area (Courtenay and Robins 1989; Swift et al. 1993). Mozambique tilapia may impact native fishes through competition for food and/or space, or through secondary effects. Martin et al. (2010) found that redspotted sunfish (Lepomis miniatus) occupied structured habitat (artificial seagrass) less often in the presence of Nile tilapia Oreochromis niloticus (a related species to Mozambique tilapia) than in single species laboratory trials. In addition, predators (largemouth bass Micropterus salmoides) consumed significantly more sunfish than tilapia when structure was present, compared to trials without structure. Remarks: Some records of this species apparently are based on incorrect identifications. For instance, recent electrophoretic evidence indicated that populations in the San Marcos River and in Canyon Reservoir were O. mossambicus x O. aureus hybrids (Howells 1991, 1992b). With the aid of W. Smith-Vaniz, we examined preserved juveniles catalogued as O. mossambicus from the San Marcos River (TCWC 2073.01) and determined them to be O. aureus based on their caudal fin patterns and scale and gill raker counts. Some California records of this species may actually be those of O. urolepis (= O. hornorum) or of hybrids between O. mossambicus and O. urolepis (Swift et al. 1993). The occurrence of O. mossambicus in the United States was reviewed by Courtenay and McCann (1981), Wieland et al. (1982), and Courtenay et al. (1986). The history of this species introduction into the southwestern United States was reviewed by Hoover (1971), Courtenay and Robins (1989), Shapovalov et al. (1981), and Swift et al. (1993). Oreochromis mossambicus has largely replaced redbelly tilapia Tilapia zillii in the Salton Sea and possibly other areas in southern California (Swift et al. 1993). Collection sites and reported localities are mapped for the United States (Courtenay and Hensley 1979; Lee et al. 1980 et seq. ), and for the states of Arizona (Minckley 1973; Grabowski et al. 1984) and Florida (Courtenay et al. 1974; Hogg 1976b; Courtenay and Hensley 1979; Kushlan 1986; Loftus and Kushlan 1987). Because of its presence in Dade County, Florida, Courtenay (1989) indicated that the Mozambique tilapia may eventually enter Everglades National Park. Electrofishing was an effective way to remove adults from a population during a project in Australia, but the removal was met with questionable success because the number of juveniles greatly increased as the adult numbers decreased (Thuesen et al. 2011). Bowen (1980) suggested that different detrital nonprotein amino acid concentrations may help to explain variable establishment success and growth of O. mossambicus. Voucher specimens: Alabama (AUM 24075); California (AUM 24653); Florida (UF 34908, 92216), Idaho (UMMZ 213374). Brock, V.E. 1954. A note on the spawning of Tilapia mossambica in sea water. Copeia 1954: 72. Brown, W.H. 1961. First record of the African mouthbreeder Tilapia mossambica Peters in Texas. Texas Journal of Science 13:352-354. Burger J., K. Cooper, D.J. Gochfeld, J.E. Saliva, C. Safina, D. Lipsky, and M. Cochfeld. 1992. Dominance of Tilapia mossambica, an introduced fish species, in three Puerto Rican estuaries. Estuaries 15: 239-245. Courtenay, W.R., Jr. 1989. Exotic fishes in the National Park System. Pages 237-252 in L.K. Thomas, ed. Proceedings of the 1986 conference on science in the national parks, volume 5. Management of exotic species in natural communities. U.S. National Park Service and George Wright Society, Washington, DC. Courtenay, W.R., Jr., and J.A. McCann. 1981. Status and impact of exotic fish presently established in U.S. open waters (September 1, 1980; revised April 1981). In-House Report, National Fishery Research Laboratory, U.S. Fish and Wildlife Service, Gainesville, FL. Courtenay, W.R., Jr., D.A. Hensley, J.N. Taylor, and J.A. McCann. 1986. Distribution of exotic fishes in North America. Pages 675-698 in C.H. Hocutt, and E.O. Wiley, eds. The zoogeography of North American freshwater fishes. John Wiley and Sons, New York, NY. Courtenay, W.R., Jr., D.P. Jennings, and J.D. Williams. 1991. Appendix 2: exotic fishes. Pages 97-107 in Robins, C.R., R.M. Bailey, C.E. Bond, J.R. Brooker, E.A. Lachner, R.N. Lea, and W.B. Scott, eds. Common and scientific names of fishes from the United States and Canada, 5th edition. American Fisheries Society Special Publication 20. American Fisheries Society, Bethesda, MD. Erdsman, D.S. 1984. Exotic fishes in Puerto Rico. Pages 162-176 in W.R. Courtenay, Jr., and J.R. Stauffer, Jr., eds. Distribution, biology and management of exotic fishes. Johns Hopkins University Press, Baltimore, MD. Farm, B. - U.S. Geological Survey, Hawaii Volcanoes National Park, HI. Grabowski, S.J., S.D. Hiebert, and D.M. Lieberman. 1984. Potential for introduction of three species of nonnative fishes into central Arizona via the Central Arizona Project ? A literature review and analysis. REC-ERC-84-7. U.S. Department of the Interior, Bureau of Reclamation, Denver, CO.
Heyne, T., B. Tribbey, M. Brooks, and J. Smith. 1991. First record of Mozambique tilapia in the San Joaquin Valley, California. California Fish and Game 77(1):53-54. Hogg, R.G. 1976a. Ecology of fishes of the family Cichlidae introduced into the fresh waters of Dade County, Florida. Unpublished doctoral dissertation. University of Miami, Coral Gables, FL. 142 pp. Hoover, F.G. 1971. Status report on Tilapia mossambica (Peters) in southern California. California Department of Fish and Game, Inland Fisheries Administrative Report 716. Unpublished mimeograph. Hoover, F.G. and J.A. St. Amant. 1970. Establishment of Tilapia mossambica (Peters) in Bard Valley, Imperial County, California. California Fish and Game 56(1):70-71. Howells, R.G. 1991. Electrophoretic identification of feral and domestic tilapia in Texas. Texas Parks and Wildlife Department, Management Data Series 62, Austin, TX. Howells, R.G. 1992a. Annotated list of introduced non-native fishes, mollusks, crustaceans and aquatic plants in Texas waters. Texas Parks and Wildlife Department, Management Data Series 78, Austin, TX. Howells, R.G. 1992b. Guide to identification of harmful and potentially harmful fishes, shellfishes and aquatic plants prohibited in Texas. Texas Parks and Wildlife Department Special Publication, Austin, TX. Knaggs, E.H. 1977. Status of the genus Tilapia in California's estuarine and marine waters. Cal-Nevada Wildlife Transactions 1977:60-67. Lee, D. S., C. R. Gilbert, C. H. Hocutt, R. E. Jenkins, D.E. McAllister, and J.R. Stauffer, Jr. 1980 et seq. Atlas of North American freshwater fishes. North Carolina State Museum of Natural History, Raleigh, NC. Muoneke, M.I. 1988. Tilapia in Texas waters. Texas Parks and Wildlife Department, Inland Fisheries Data Series 9, Austin, TX. Ogilvie, V.E. 1969. Illustrated checklist of fishes collected from the L-15 Canal (Lake Worth Drainage District) in Palm Beach County, Florida (collection date November 8, 1969). Unpublished Report for the Florida Game and Fresh Water Fish Commission. Randall, J.E. 1987. Introductions of marine fishes to the Hawaiian Islands. Bulletin of Marine Science 41(2):490-502. Rogers, W.A. 1961. Second progress report on stocking and harvesting of tilapia and channel catfish in Alabama's state-owned and managed public fishing lakes. Federal Aid Project F-10. Alabama Department of Conservation. Russell, D.J., P.A. Thuesen, and F.E. Thomson. 2012. A review of the biology, ecology, distribution and control of Mozambique tilapia, Oreochromis mossambicus (Peters 1852) (Pisces: Cichlidae) with particular emphasis on invasive Australian populations. Reviews in Fish Biology and Fisheries 22(3):533-554. St. Amant, J.A. 1966. Addition of Tilapia mossambica Peters to the California fauna. California Fish and Game 52:54-55. Talwar, P.K., and A.G. Jhingran, editors. 1992. Inland fishes of India and adjacent countries. A.A. Balkema, Rotterdam, The Netherlands. Two volumes. Thuesen, P.A., D.J. Russell, F.E. Thomson, M.G. Pearce, T.D. Vallance, and A.E. Hogan. 2011. An evaluation of electofishing as a control measure for an invasive tilapia (Oreochromis mossambicus) population in nothern Australia. Marine and Freshwater Research 62: 110-118. Trewavas, E. 1983. Tilapiine fishes of the genera Sarotherodon, Oreochromis, and Danakilia. Publication No. 898. British Museum of Natural History, London, UK. Wieland, W., W. L. Shelton, and J.S. Ramsey. 1982. Biological synopsis of the Mozambique tilapia (Tilapia mossambica). Final report submitted to the National Fisheries Research Laboratory, U.S. Fish and Wildlife Service, Gainsville, Florida.